Is it Rosacea or Something Else? Today I’m going to help those of you who are wondering if your skin concerns are rosacea or something else! 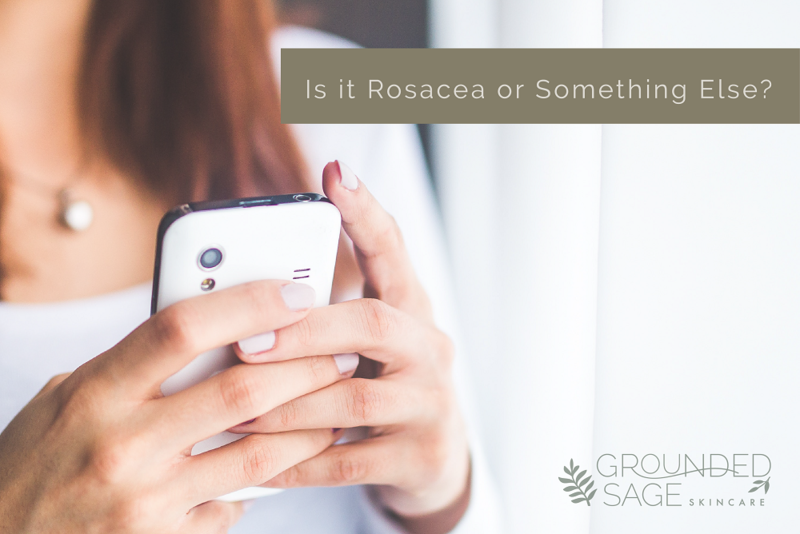 People can often confuse rosacea with acne, dermatitis (allergic reactions, rashes from irritants, etc) and even facial dandruff! So let’s set the record straight so you can make sure you’re creating a facial routine that targets the right thing! 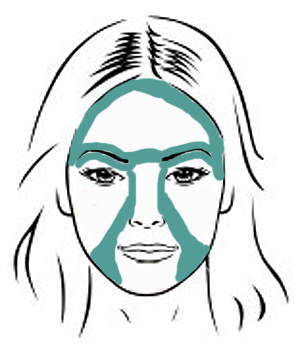 Can involved non-facial areas of the skin like neck and chest. There are several sub-types of rosacea which are classified by the location and pattern of the inflammation but they all experience the following….. The skin looks red, hot and inflamed but infection is not a factor. Waxy yellow bumps with a central pore (known as sebaceous hyperplasia papules) are present and often misidentified as milia. 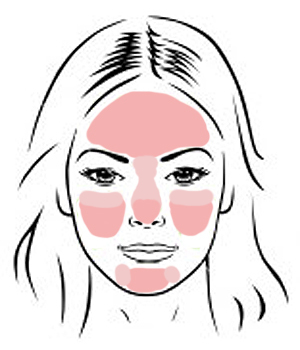 Where rosacea commonly shows up. Dark pink – most severe areas. Light pink – less severe areas. Look for blackheads, not just enlarged or clogged pores. Blackheads are more common in acne. Hormonal acne usually manifests as big, painful cysts along the jaw which is not a common site for rosacea. 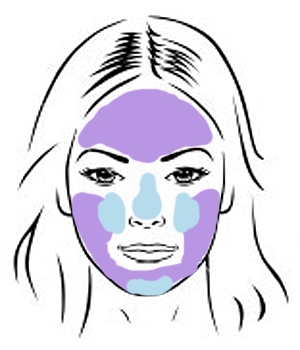 Purple – most common areas for acne breakouts. Blue – most common areas of blackheads. See our Skin Care 101 page for solutions to adult acne. Itching is often experienced with allergic reactions and many ingredients in common skin care products be can allergens that cause itching/dermatitis. Rosacea is not commonly associated with itching. There is often a dry, chapped appearance plus stinging in irritant reactions (not the case with rosacea). Common examples of this are from the use of alpha hydroxy acid (AHA) or harsh acne products. Dandruff usually involves eyebrows, hairline, ears, and along the sides of the nose – areas uncommonly affected by rosacea. 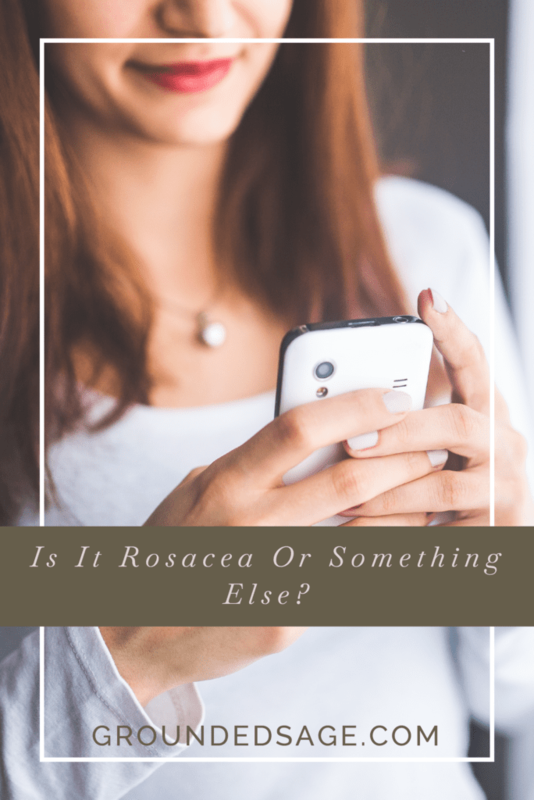 Hopefully, this clears up some common misconceptions about Rosacea. If you’re looking for more rosacea resources, CLICK HERE.